How do you get your Moose to your campsite? Yes, we do bring our Moose back in one piece! I see in some of your pictures your Moose is whole when you are at your campsite. How do you do that? Moose are huge animals and I wanted to know how you can get a Moose out of the bush and back to your campsite without cutting it into smaller pieces? Can you please post an answer in the comments section. Henry, I will answer your question here. We actually carry well over 3000 feet of rope with us when we go Moose Hunting. This enables us through the use of good old ingenuity, pulleys, pickup trucks and sheer will power to bring them home in one piece. Out of over twenty Moose we have brought more than three quarters of these back to camp whole. Moose hide is very tough and you can drag them all long ways without breaking the skin and soiling the meat. In one case we dragged a Moose about 2 kilometers (on a grassy road) until we could find a suitable place to load him into a truck. 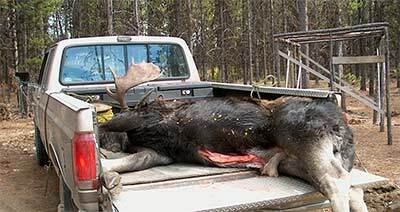 I guess what is the the next hardest thing is to get the Moose into the truck. We use pulleys or what have you to get the Moose up on a bank and then back the truck into the bank so all we have to do is slide the Moose into the truck. Sounds easy? It's not. There is a lot of planning and sweat to do this, but believe you me, it is worth it. I hope this answers your question. If not, please ask again.